INTO ETERNITY is known for providing a bridge between prog metal and melodic death metal, but since its inception in 1997, the Canadian band has marched to the beat of its own drum, assembling the pieces in a distinctly unique manner. The Regina, Saskatchewan-based collective has, for the most part, improved with each subsequent release. The group even garnered a coveted slot on Dave Mustaine's 2006 Gigantour. But since 2008's "The Incurable Tragedy", aside from releasing a couple of singles and some limited touring, the band essentially fell off the map. 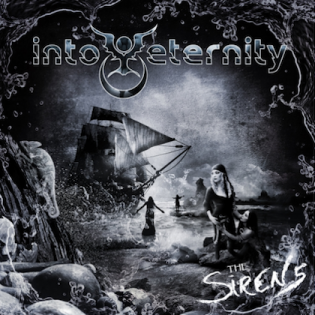 It has been a decade since its last release, the aforementioned banger "The Incurable Tragedy", but the group has finally returned with its sixth album: "The Sirens". Since its last release, the lineup has changed tremendously. Vocalist extraordinaire Stu Block departed and joined forces with ICED EARTH. The only remaining players are Troy Bleich and founding member Tim Roth. In the band's peripheral view, tragedy struck as former guitarist Rob Doherty died, in 2012, at just 41 years of age. Then, in 2016, INTO ETERNITY's former drummer Adam Sagan succumbed to cancer at the age of 35. In 2012, in the midst of tragedy and new lineup solidification, the band started working on new material. With its new lineup finally in tow—Roth and Bleich are now joined by drummer Bryan Newbury, vocalist Amanda Kiernan and guitarist Matt Cuthbertson—the Canadian band had plans to release its long-awaited album in late 2015. Whatever the nitty gritty details may be, the extended delays and silence are finally over as "The Sirens" has arrived. The skilled neoclassical shredding ensemble was firing on all cylinders toward the end of the aughts, and in spite of its time away from the spotlight, you wouldn't notice it listening to "The Sirens", which features six new tracks alongside two re-recorded singles: 2011's "Sandstorm" and 2012's "Fukushima". "The Sirens", INTO ETERNITY's sixth full-length album, is everything longtime fans would expect and want. 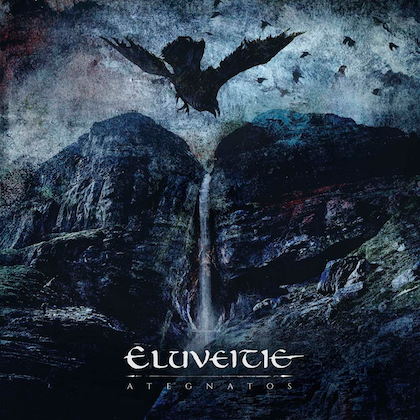 Though difficult to neatly pigeonhole, the band can accurately be described as progressive, melodic death metal, but it doesn't really sound like either prog or death metal, not in the most clear-cut of ways, anyway. 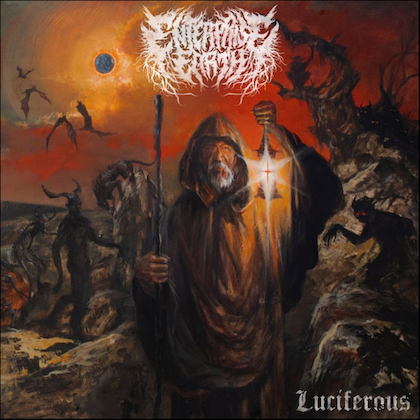 INTO ETERNITY may lean too much toward one end or the other, depending upon which purist you may be asking, but it's turned heads because of its unique spin on extreme metal, which also encompasses thrash and traditional metal stylings. The energetic and interesting heavy metal racket continues to be narrated by the blend of dueling vocals that are soaring and melodic on one end, with rough death metal grunts and black metal screams on the other. The title track opens things up with a pensive piano lead backed by subtle symphonic elements, including strings, to adequately set the stage for the epic noodling prog surge that follows a couple of minutes later. From there, and in a manner representative of the entirety of the release, the band masterfully toys with a variety of metal styles from the curiously effective chunky "breakdown" riff to the display of its manic, death thrashing capabilities. The release is overflowing with INTO ETERNITY's characteristic melodic vocal led chorus sections. Kiernan isn't quite the singer that her predecessor was; however, she's a formidable replacement and an impressive talent in her own right. She's a perfect fit for INTO ETERNITY, and perhaps shines brightest on the mesmerizing "Fringes of Psychosis". Guitarist Roth and bassist Bleich remind listeners of their continued vocal value to the band with their impressive contributions to "Sandstorm". If there was any question as to whether or not INTO ETERNITY was able to march forward as powerfully as it did with Block, "Sandstorm" would, in fact, be proof in the pudding, considering how good the three-pronged vocal attack stands measured against the 2011 version, which featured Block's vocals. If there's one drawback on "The Sirens", it's the length of the solos. Sure, they're impressive and enjoyable, but they regularly outstay their welcome, like that one person at every party who never gets the hint that it's time to leave. 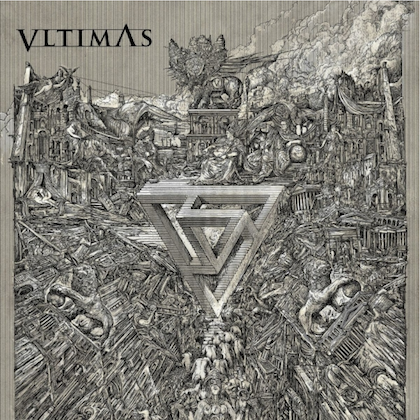 That's but a small blemish on one hell of a fantastic album from an incredibly talented and reliable metal band that has fortunately returned to center stage. It's almost as though INTO ETERNITY never left. Here's hoping that the group doesn't have another decade long absence any time soon.